The staircase is an important architectural element in a home. It not only connects one floor to another, but it is a crucial design element that sets the tone for the rest of your space. If you are looking into updating your staircase without gutting it and starting from scratch, below are 3 great tips on how to achieve the wow effect. You don’t have to break the bank or spend a lot of time on this project in order to see an amazing result. But, before you embark in this project, here are a some of terms and stair parts that might come in handy for your project. You might realize that changing one or two of the elements of the staircase might do the trick and give you the desired look! Balusters are the spindles that hold up the handrail. The baluster contributes to the overall design of the staircase. You can have highly ornate or simple and plain balusters. The handrail is the part that forms the top of the railing. 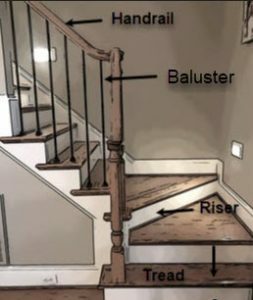 If the staircase has balusters, it sits on the balusters. Most are made from wood or metal. The tread is the top or flat step surface. This is what you step on ascending or descending the staircase. Treads can be made from wood, metal, or even glass. The riser is the portion of the staircase that rises vertically and is the face of the steps. The newel is the main post at the bottom and top of a staircase that lends main support for the handrail banister. 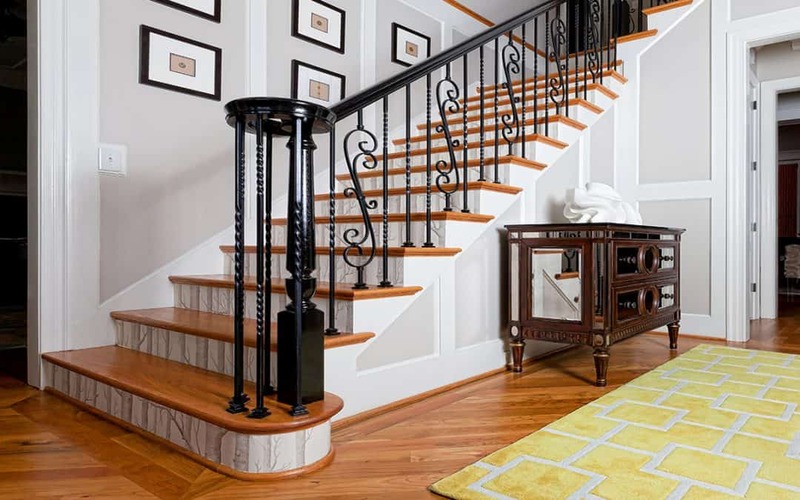 One of the most cost-effective ways to update an older staircase is to refinish it. 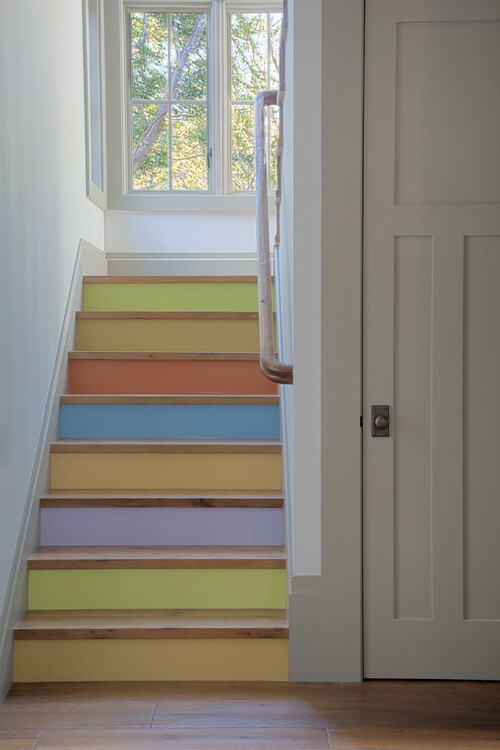 Paint can bring about a wonderful transformation and allow you to personalize your stairs. It’s amazing how you can transform your stairs by just painting the balusters and refinishing the handrail. Black and white is always a great choice whether your space is traditional, transitional or modern. Paint your balusters and /or your handrail black for a dramatic first impression. 2. Highlight your Risers- they don’t have to be boring! Doing something fun with your risers is a great way to dress up your stairs. 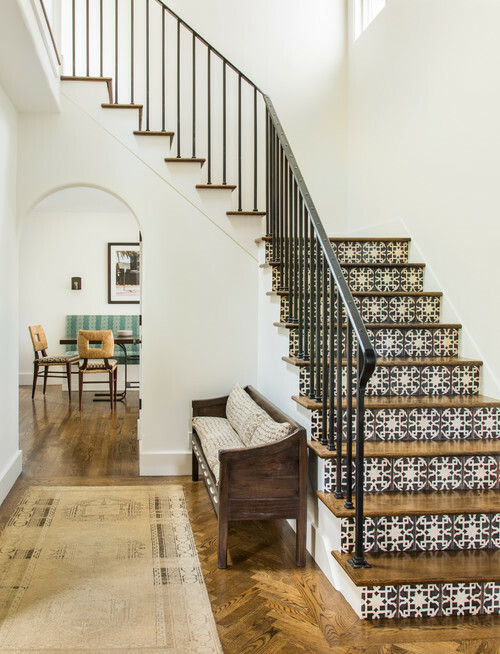 Use tile, paint, wallpaper, contrasting wood or even decorative metals to glam up your risers and and give your staircase the wow effect. Paint is one of my favorite ways to refresh that tired, lifeless staircase. A little paint goes a long way: paint is cheap, there are endless colors to chose from and it is easily done. Painted risers are so much fun- and the best is, you can paint in your favorite colors! Wallpaper is another great option to use on your risers. Use a bold geometric wallpaper, a soft flowery one or any design that you love on them! 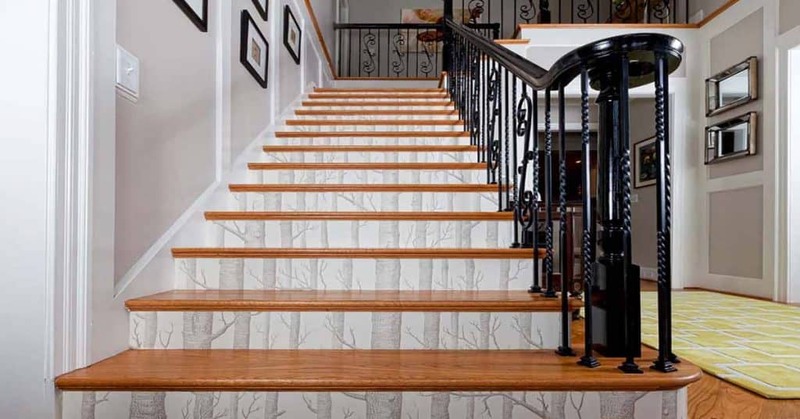 Wallpapered risers really make going up and down the stairs a wonderful experience. I actually wallpapered my own stairs and I absolutely love them. The only downside to wallpaper on the risers is that you do have to be a little careful with them; you just can’t let the kids run up the stairs with their dirty shoes…it is hard to clean especially if you have picked a wallpaper with a very light background. 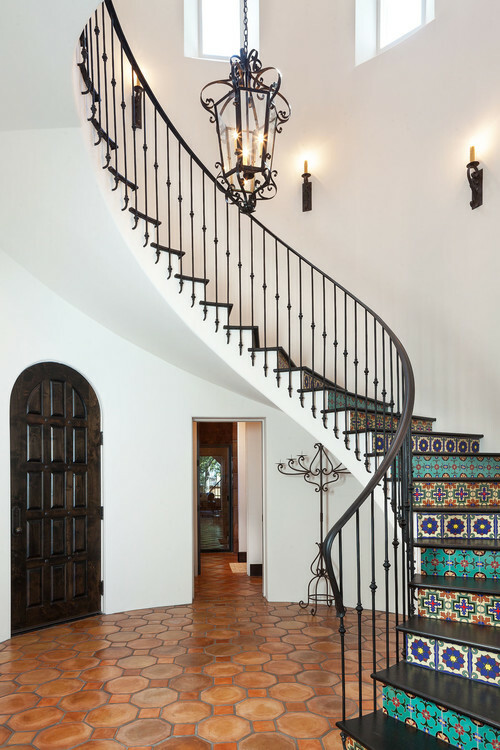 Decorative tile is also a fabulous alternative for stair risers. For a more classic look use the same tile for all the risers. For a bolder look alternate the pattern of tile on the risers and create your own stellar design! 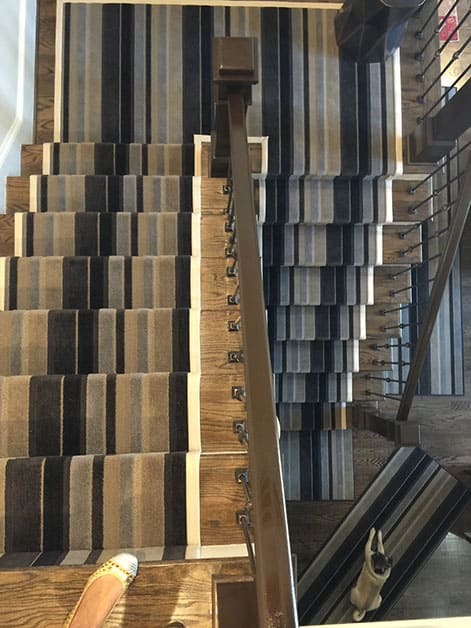 New wall to wall carpet can work wonders for a tired staircase, and is usually the only realistic option for home owners whose stairs are manufactured from plywood, MDF or concrete. As there is an enormous range of colors and designs to choose from, you can use carpet to make a striking statement. Jazz up your staircase with carpet in your favorite design and color scheme! Staircases that do have wooden treads, can also profit from carpet runners as they add warmth, color and pattern to the staircase. Carpet runners bring an extra splash of color into your home and help to tie together the decor of your second and first level. Carpet runners can transform an ordinary staircase into a luxuriously warm and elegant focal point in your home. 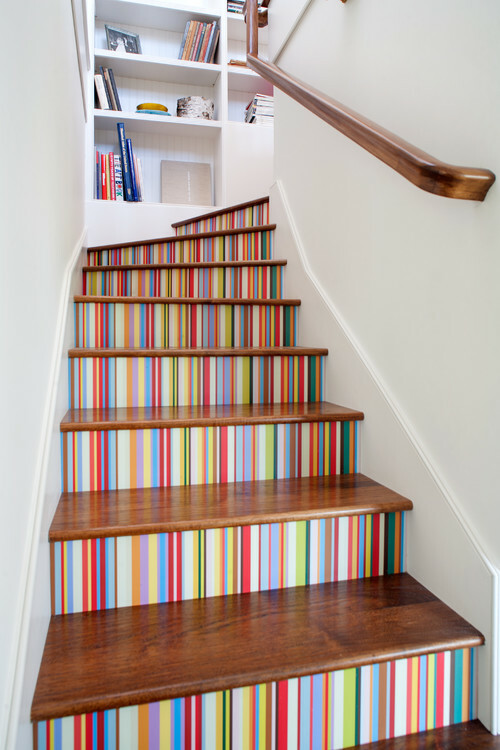 Updating your staircase can be a fun and easy project. Your staircase is one of the elements that sets the tone for the rest of your home decor. Make sure it reflects your personality and it is perfectly you. Have fun with your project! I am loving some of the ideas, how about you?